gE.CO Living Lab aims at creating a platform for bringing together and supporting formal groups or informal communities of citizens who manage fab-lab, hubs, incubators, co-creation spaces, social centres created in regenerated urban voids. These innovative practices are considered generative commons, because they are based on sharing and collaboration between citizens and establish a new partnership between Public Institutions and local communities. Generative commons represent a successful strategy to promote a local and sustainable model of development since they can set forth alternative forms of work, collaborative economies and welfare services. Proximity and solidarity are the key words for facing the social and economic consequences of the fourth industrial revolution, which is changing cities and urban landscapes across the world. Public Institutions have to respond to the massive introduction of automation, robotisation and digitisation supporting and promoting new models of local business. Generative commons are one of the most interesting solution to achieve this goal, because they favour the creation of sustainable and collaborative economies based on the building of communities, the valorisation of local public assets, the inclusion and non-discrimination of social minorities, as well as on the enhancement of youth entrepreneurship, awareness towards environmental issues and solidarity. In the last years, generative commons have increasingly conquered our cities: fab-labs are holding innovative forms of handcrafted productions, while new spaces of aggregation and sociality, hubs, incubators, co-creation spaces are providing essential services in the outskirts. A new class of social innovators and makers is emerging: their raw materials are immaterial resources as cultural and social practices, knowledge and frugal technologies. In other words, the unexpected consequence of the fourth industrial revolution is the relaunch of a new urban ecosystem based on human relationships, in which citizens are engaged and mobilized in creating innovative solutions to important social issues as poverty, inequalities, education, health or shelter emergency by: developing new economic circuits and alternative forms of production; involving in the process underrepresented groups; and promoting social integration. These experiments create thus new knowledge and ideas and transform them into social and economic development, by promoting and supporting citizens’ iniatives, Public Institutions have the opportunity to provide new public value creating innovative public-civic partnerships. Nevertheless, the risk is that by coopting citizens’ initiatives, their transformative potentiality decreases. So the question is: how can Public Institutions support the development and the growth of these innovative practices, without compromising their participatory character and their great spontaneity? Actually, many community-driven initiatives arise in unused post-industrial sites, derelict buildings, neglected green areas or abandoned railways, spaces where new collaborative economies and self-organized welfare services are arising. This situation finds an interesting example in the several self-organized experiences emerging in Greece, where the cumulative shrinkage of GDP by 25% from 2008 to the end of 2013 led to a dramatic spike in unemployment. In that period, a civic drive towards self-organisation, self-management and self-empowerment emerged with the (informal) establishment of several self-managed spaces, social centres and local citizen initiatives. At present, various sources suggest the existence of around 400 solidarity movements. To give an indication of the scale of these movements and of their operations, only in Attica there are: 40 solidarity clinics with an average of 46 volunteers per clinic guaranteeing around 2000 medical examination per month; 47 food solidarity structures and 21 solidarity kitchens with around 56 volunteers per group which, only in 2014, distributed 4318 parcels of food fortnightly; 45 without middlemen goods distribution groups with more than 5000 tons of distributed products, only considering the years 2012-2014. Citizens’ engagement in the regeneration of urban voids and their participation in new forms of production are a phenomenon that constantly branch out: generative commons are destined to become an alternative and sustainable model of economic growth, representing a local solution to face global transformations. For this reason, gE.CO Living Lab is a very timing action: the overall objective of gE.CO Living Lab is to promote generative commons and to enhance their great potentials, by providing citizens and Public Institutions with the necessary support for organizing innovative economic activities and welfare services. 1. It will bring together generative commons using a digital platform for collaboration. The gE.CO platform will map citizens’ initiatives as well as those Public Institutions engaged in new forms of partnership with local communities. Generative commons and municipalities will be connected in a new network that will promote the exchange of good practices and legal solutions. 2. It will evaluate a group of pilot cases composed by generative commons and municipalities in order to understand which socio-economic, cultural and legal factors make self-organized experiences sustainable and Public Institutions helpful for their development. 3. 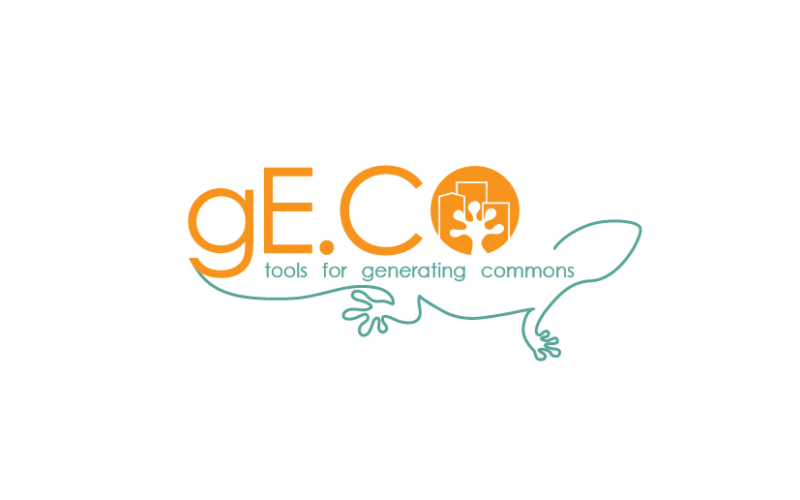 It will use the results of the evaluation for scaling up sustainable generative commons and innovative local policies: best practices, recommendations for scaling experiences of generative commons as well as legal solutions will be packaged in the gE.CO Do-It-Yourself (DIY) Package, for supporting the emergence of new generative commons through shared, public and open access contents.